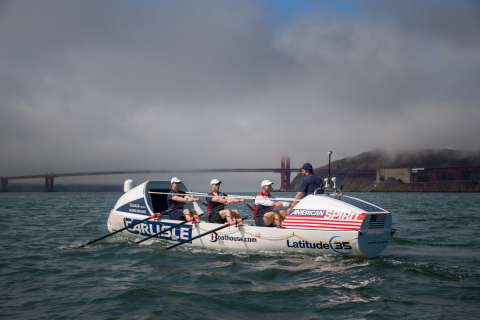 SCOTTSDALE, Ariz.--(BUSINESS WIRE)--Carlisle Companies Incorporated’s (NYSE:CSL) American Spirit is preparing to row across the Atlantic Ocean in the Atlantic Challenge, where the competitors will begin this major nautical event on December 15. This is Carlisle’s 2nd year sponsoring the American Spirit, a custom vessel designed and built to compete specifically in the Atlantic Challenge. Having set the American record in last year's race, the new team is setting the bar higher looking for on outright win in the 2016 crossing. The Atlantic Challenge, known as the "World's Toughest Row" in the sports world, pits mankind against the ocean, with participants rowing westward from the Canary Islands, off the coast of Africa, battling across open and wild seas to the Caribbean. Competitors hail from around the globe and will spend approximately 5-6 continuous weeks at sea in this grueling contest where they will row more than 3,000 nautical miles. Carlisle’s 2016 American Spirit crew is a U.S./U.K. team comprised of two Americans and two Britons. Jason Caldwell returns this year to captain the vessel and lead what he is confident will be this year's winning team. Angus Collins, a U.K. ocean racing veteran joined the team after having set the World Record in 2014 for the fastest Indian Ocean crossing as well as the Course Record in the Atlantic and, at the completion of the 2016 Atlantic Challenge, will be the first person in history to row 3 oceans in 3 consecutive years. Also joining the American Spirit crew is Briton Alex Simpson, the former Indian Ocean rowing teammate of Angus and, at 6'5", has been described by his peers as one of the most physically and mentally tenacious rowers in the sport. Rounding out the 4-man crew is American Matt Brown, Jason's former teammate at Vesper's elite rowing team in Philadelphia where they won a number of National Titles. Prior to that Matt rowed at Yale and Oxford competing in the Yale-Harvard race as well as England's most prestigious Oxford-Cambridge Boat Race. Organizing and managing this effort is Tom Magarov, last year's American Spirit crew member, whose experience as a racer and attention to detail adds a unique advantage to the team. The grit and determination of this year's crew, combined with their unprecedented ocean rowing experience, will make this year's race something special to watch. With up to three rowing positions, these athletes will be pulling the American Spirit 24 hours a day through ocean waves, often 10-40 feet or higher, in an attempt to achieve a new Atlantic world record crossing time under nature's relentless and intense conditions. Explaining Carlisle's commitment to this extreme challenge, D. Christian “Chris” Koch, President and Chief Executive Officer said, “We are again honored to partner with the crew of Carlisle's American Spirit in their quest to win the Atlantic Challenge. Carlisle’s relationship with the team of the American Spirit began when its Captain, Jason Caldwell, worked with many of Carlisle's top and emerging leaders through our flagship leadership development program on the campus of Indiana University. Carlisle's American Spirit, at just 28 feet (8.64 meters) long and less than 6 feet (1.74 meters) wide, contains the latest technology, safety equipment and rations to support the Carlisle team in the Atlantic Challenge fours event. "Our team of more than 13,000 employees are excited to again watch the American Spirit and her crew as they attempt to break the record for the Atlantic crossing. We will be following their progress at http://carlisle-crew-usa.com/blog and many social media sites, including Facebook. Carlisle’s American Spirit sets off from San Sebastian de La Gomera in the Canary Islands on December 15, 2016 and expects to arrive at Nelson’s Dockyard English Harbour, Antigua approximately 5-6 weeks later. Due to the extreme requirements of the Atlantic Challenge, Carlisle's worldwide team of employees is ready to provide high performance solutions to ensure the success of Carlisle's American Spirit team during the race, just as they provide high performance solutions for Carlisle’s customers in their own races to meet the challenges of their businesses every day.